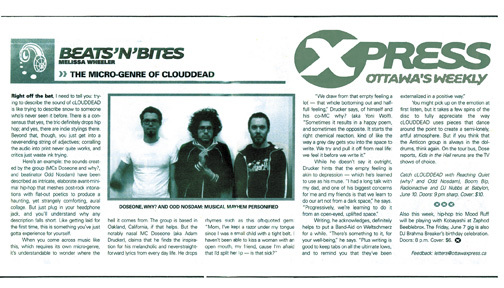 Right of the bat, I need to tell you: trying to describe the sound of cLOUDDEAD is like trying to describe snow to someone who has never seen it before. There is a consensus that yes, the trio definitely drops hip-hop; and yes, there are indie stylings there. Beyond that, though, you just get into a never-ending string of adjectives; corralling the audio into print never quite works, and critics just waste ink trying. Here's and example: the sounds created by the group (MCs Doseone and why?, and beatinator Odd Nosdam) have been described as intricate, elaborate avant-minimal hip-hop that meshes post-rock intonations with flat-out poetics to produce a haunting, yet strangely comforting, aural collage. But just plug in your headphone jack, and you'll understand why any description falls short. Like getting laid for the first time, this is just gotta experience for yourself. When you come across music like this, which requires its own micro-genre, it's understandable to wonder where the hell it comes from. The group is based in Oakland, California, if that helps. But notably nasal MC Doseone (aka Adam Drucker), claims that he finds the inspiration for his melancholic and never-straight-forward lyrics from every day life. He drops rhymes such as this oft-quoted gem: "Mom, I've kept a razor under my tongue since I was a small child with a tight belt. I haven't been able to kiss a woman with an open mouth, my friend, cause I'm afraid that I'd split her lip--isn't that sick?" "We draw from that empty feeling a lot--that hope bottoming out and half-full feeling," Drecker says, of himself and his co-MC why? (aka Yoni Wolf). "Sometimes it results in a happy poem, and sometimes the opposite. It starts the right chemical reaction, kind of like the way a gray day gets you into a space to write. We try and pull it off from real life: we feel it before we write it." While he doesn't say it outright, Drucker hints that the empty feeling is akin to depression-- which he learns to use as his muse. "I had a long talk with my dad, and one of his biggest concerns for me and my friends is that we learn to do our art not from a dark space," he says. "Progressively, we're learning to do it from an open-eyed, uplifted space." Writing, he acknowledges definitely helps to put a Band-Aid on Weltschmerz for a while. " There's something to it, for your well-being," he says. "Plus writing is good to keep tabs on all the ultimate lows, and to remind you that they've been externalized in a positive way." You might pick up on the emotion on the first listen, but it takes a few spins of the disc to fully appreciate the way cLOUDDEAD uses pieces that dance around the point to create semi-lonely, artful atmosphere. But if you think that Anticon group is always in the doldrums, think again. On the tour bus, Dose reports, Kids in the Hall are the TV shows of choice.